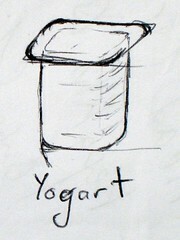 Been practising drawing tubs of Yoghurt recently. Well I have an idea for a T-shirt that requires one. Been thinking of putting up a CafePress site of T-shirts, just need to get round to drawing the pictures. Here is a look at the latest version. Needs more work. This entry was posted in Photos, T-shirt and tagged drawing, sketch, tshirt, yoghurt. Bookmark the permalink.